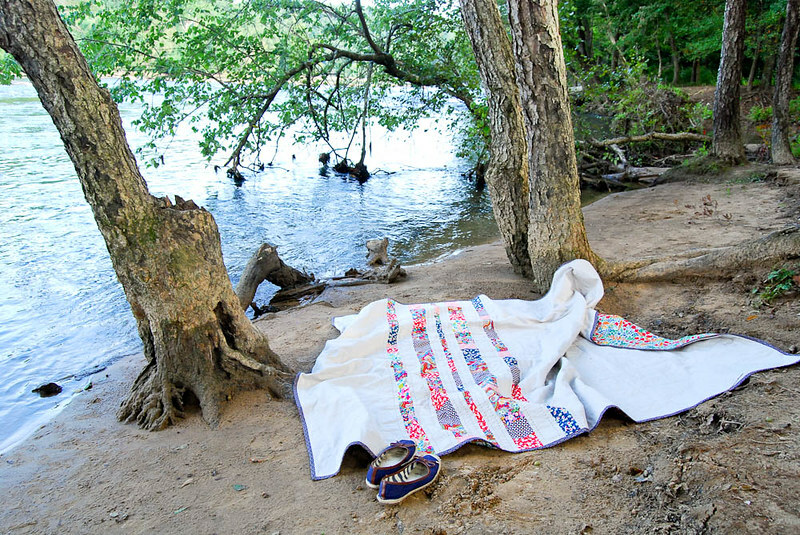 a²(w): Liberty Quilt Guest tutorial! A few months ago Liberty contacted me about doing a tutorial for their blog. Yes, THE Liberty Fabric. That's not something I could say no to!! - Scrappy stripes. Liberty is expensive, so I wanted a project that would make use of all the little scraps that we have (or of a fat sixteenth bundle). - Flannel batting. My first quilt used flannel and it's the best. It's super comfy and is still our go-to couch quilt. Plus, you don't need super dense quilting since it's a woven product, unlike cotton batting which need the quilting to hold it together. - Tana Lawn. Backed in yards of Liberty Lawn yumminess, this is the softest!! The binding is lawn too. Yum! I'm so pleased. I loved it so much that I hand quilted it in a marathon session. About 60 feet of quilting. Oy! 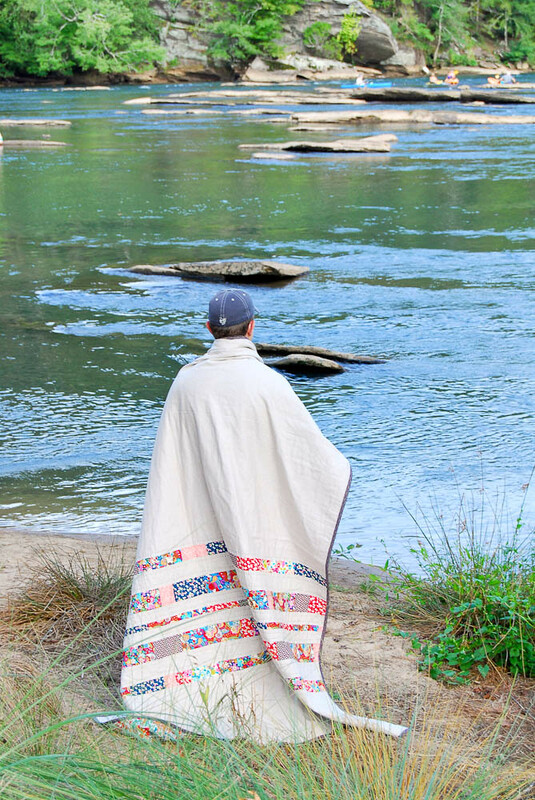 I could go on and on about how much I love this quilt. 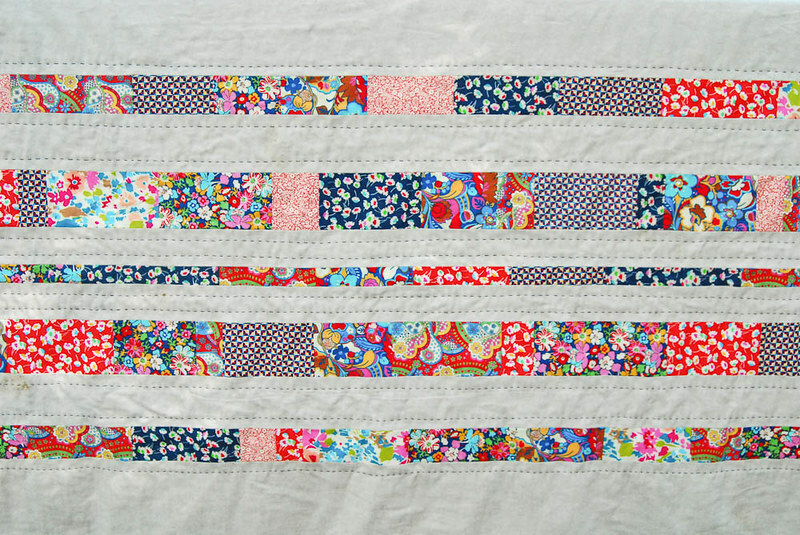 The reds, blues, and pinks in the Liberty Lifestyle Bloomsbury collection made me so happy all over my cutting table. A bit nautical, a bit fancy, a bit fun. And that lawn back: a dream. If you're looking for a quick scrappy project, check it out on the Liberty blog, or below! 1. Cut one 84” length from the backing fabric. Trim off the selvedges and set aside. 2. From the remaining backing fabric, cut in the half to form 2 pieces 42” x 26”. Trim selvedges. 3. Sew the two pieces together using a 1/4” seam allowance to make one piece that is 83.5” x 26”. Press seam open. *Pay close attention if you are using a directional print. 4. Sew the 26” wide piece to the 54” wide piece along the 84” edge using a 1/4” seam allowance. Press seam open. You should now have a piece that is approx. 84” x 79”. Set aside. 5. Cut the 5 yards on flannel in half to create two pieces approx. 90” x width of fabric. Trim selvedges. Sew the two pieces together along a 90” length using is 1/2” seam allowance. Press open. You should now have a piece that is approx. 90” x 80”. 6. 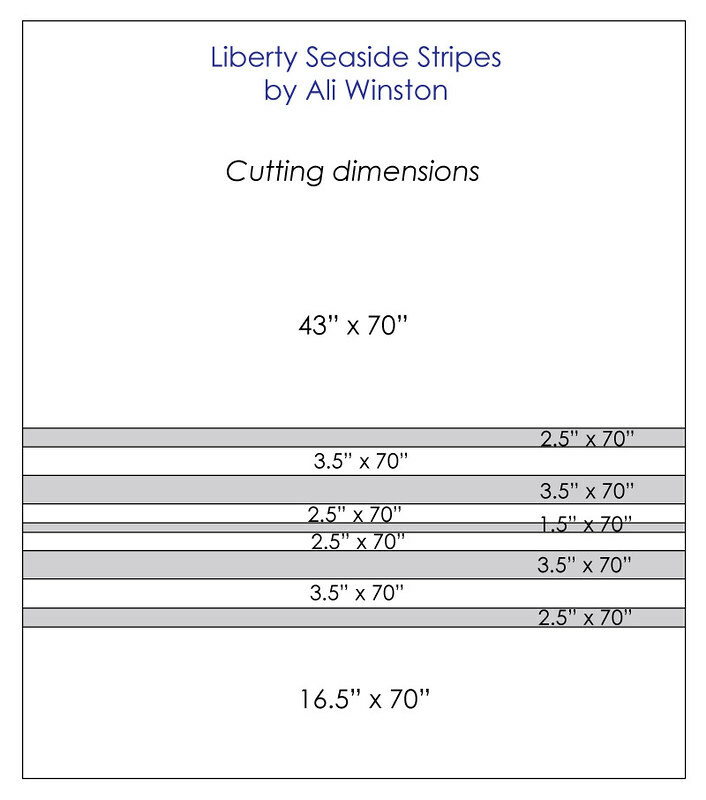 From the 0.5 yards for binding, cut 7 strips 2.5” wide. Sew pieces together to create binding. Assemble the Patchwork Stripes: 1. From your scraps, cut pieces that are varying lengths and 1.5” tall, 2.5” tall, and 3.5” tall. You will need more 2.5” and 3.5” pieces than 1.5” pieces. 3. Repeat step 2 with the 2.5” and 3.5” pieces. You will need to create 2 70” rows of each of these. 4. Continue joining the rows in pairs and pressing seams open until the bottom portion of the quilt is assembled. 5. 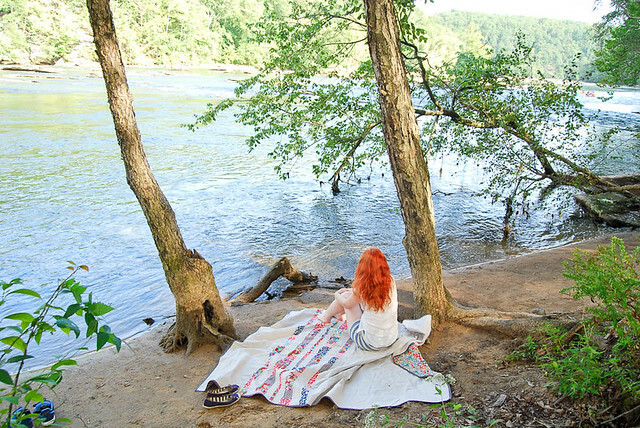 Sew the bottom half with stripes to the remaining 43” x 70” linen. Press seam open. 1. Tape flannel to the floor so that the piece is taut. Smooth the quilt back onto it, right side up. Working in small strips, peel back the backing, spray the flannel, then smooth the backing back down. 2. Repeat step 1 with the quilt top. 3. 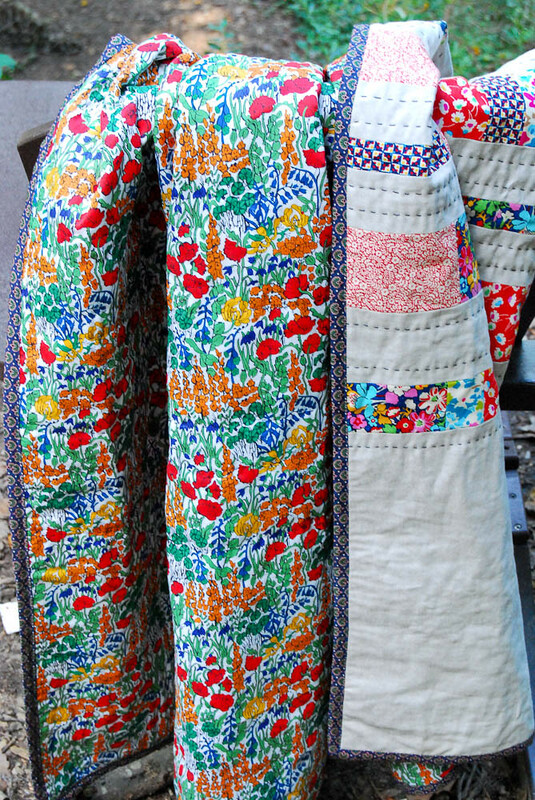 Quilt by hand or by machine. Trim. Bind.